Recently there has been a rise in interest among young people for the rhythm section of the band...the drums. 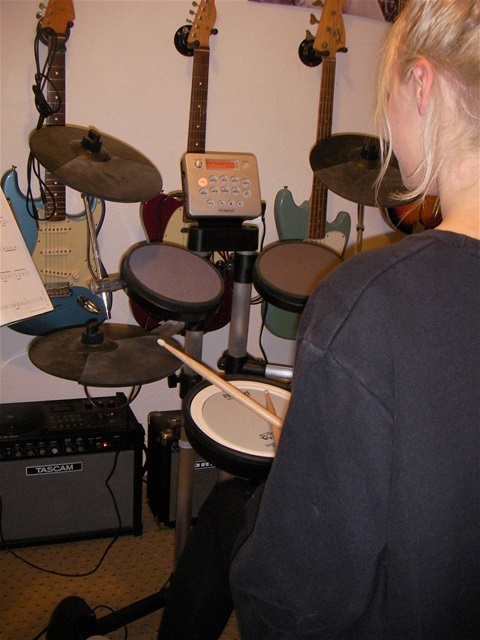 I am able to help the beginner learn and develop up to about Grade 3 level, enough to get them confident and knowledgeable as a drummer, so that they can join a band and grow their abilities further. In the studio at Red House, I have a set of Roland V-Drums, acknowledged as probably the best electronic kit around. This means that you don't have to worry about noise...unless we turn it up loud! It is also a friendly, non-threatening size for young people, yet is a fully-functioning drumkit for adults. It makes some weird and fun pre-set sounds, too. I use a mixture of the Rockschool Grade books and Colin Woolway's 'Drumsense'.